Fleet decision-makers are battling to run vehicles as efficiently and effectively as possible amid political and economic turmoil, and the 2019 ICFM Annual Members’ Conference will aim to provide them with insight to make their operations as resilient as possible. This year’s Conference, entitled ‘Fleet resilience – Managing Uncertainty in the Current Climate’, will be held on Tuesday, May 21st, at the iconic Wembley Stadium in London. Sponsored by vehicle leasing and fleet management company Hitachi Capital Vehicle Solution and the UK’s leading retailer of prestige cars, Sytner Group, the Conference is also supported by fleet suppliers: AX, Epyx, Jaama, Selsia Vehicle Accident Centres and TMC (The Miles Consultancy). 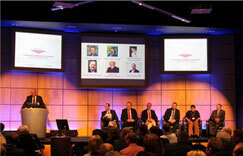 Experts from different organisations working with and advising fleets, including Government, will focus on providing advice and information aimed at helping fleet decision-makers arrive at the right strategic and practical decisions for their company car and van operations as the UK faces up to Brexit, a possible general election and numerous issues that directly impact on vehicle operations including: future company car benefit-in-kind tax changes, the introduction of Clean Air Zones and a plug-in and ultra-low emission future. Justin Patterson, head of fleet operations, Addison Lee. Conference celebrity guest speaker will be one of the UK’s best known football commentators, John Motson, affectionately known as ‘Motty’, who will give an insight into his long career. The event will also include the presentation of awards to fleet decision-makers that have successfully completed ICFM training courses in the past 12 months. ICFM qualifications are viewed as the de facto stamp of approval for employees with fleet responsibility whether as full-time professional fleet managers or as part of an HR, finance or procurement role. ICFM director Peter Eldridge said: “The Conference focus this year is firmly on providing fleet operators with an insight into making the right strategic decisions in what is proving to be perhaps the most challenging period in fleet history. “The evolution of the fleet sector is becoming ever more rapid and without the skills that ICFM training provides, and the ability to quiz industry experts at the annual ICFM Conference, fleet decision-makers could find themselves making poor decisions that will impact on the operating efficiency and effectiveness of their vehicles and businesses. 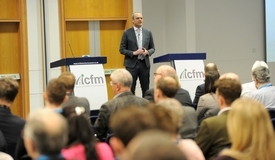 ICFM members, who may also take a guest who has an interest in fleet, can book their free Conference place via the ICFM website – www.icfm.com. The Conference will commence at 9.30am (registration from 8.30am) and finish at 3.45pm.